Changed title from "Medeival Keep from blue board" to "Medieval Keep from blue board"
That is excellent. Black Magic craft would be proud. What scale is it for? It's going to take a horde of 28mm Barbarians to take that keep! I know you can make a siege tower and ram out of Blueboard as well. Years ago I made a similar looking castle that got out of hand. When finished it was 3' x 5' with a church and portcullis in the main tower guarding the gate. The problem was I never had enough figures to attack it properly. Finally traded it off for some 15mm F&I figs. Great work Anton! Kaiju Doug, thanks for the kind words, my problem is that I am short on storage already; I have a 1/50 scale model of the Castillo de San Marcos and two fleets of 28mm VSF predreadnoughts. 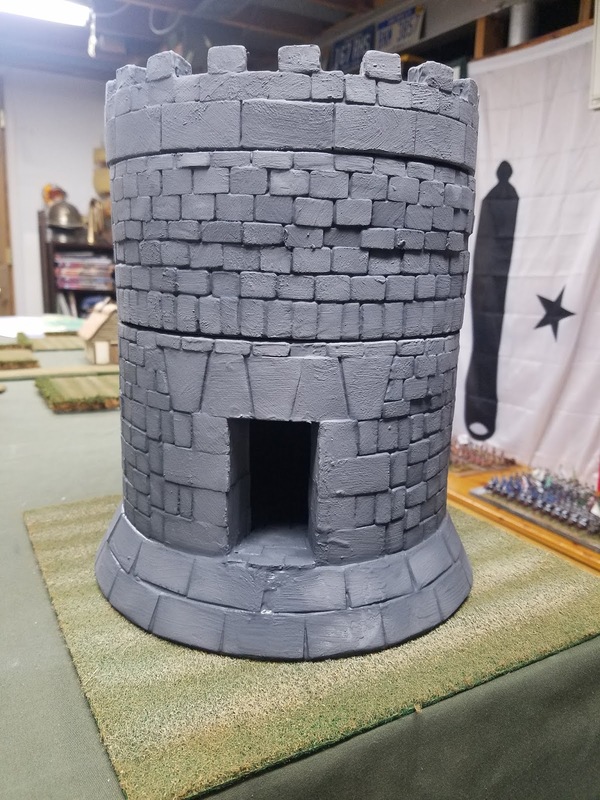 The silly part is that I already have a Hudson and Allen castle (two actually) painted and ready to go complete with defenders and attackers with a tower and a ram!!! That is what I mean that I have to have a plan and stick with it! Very impressive, I have to admire your Patience. Cutting out and sticking all those Stones would have driven me crazy. Been trying to figure out if I need to make a circular cutter adapter for my Proxxon. This might give me a reason to put one together. Beautiful work, by the way. 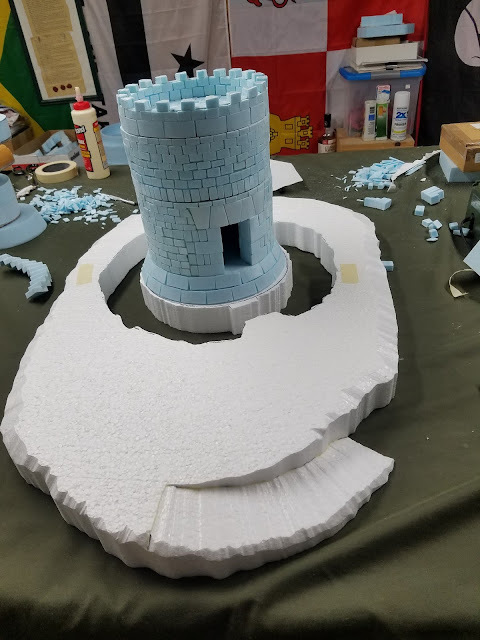 Love that you used white styrofoam for the surrounding terrain. Another good demonstration of options to consider when terrain making. Cheers! The easiest and cheapest way is to take a bit of masking tape and tape a pushpin face up on the work table, you have a limited radius but it makes decent circles. Great suggestion! Love it! Will give that a go. Cheers! Oh my God, that tower looks amazing! Lovely project, very impressive ! Must be a tremendous job to carry all the water up the knoll to keep the moat filled. I really love your spiral staircase. chicklewis, you reminded me of a water candle product, popular in the USA back in the 1970's… It was a glass filled near the top with water. You then poured in a layer of oil, which floated atop the water. Into that oil layer, you added a plastic circle (floated on top of the oil layer), which held a wick, which extended into the oil. Lighting the wick would burn off the oil, over time. The oil, however, covered the water, preventing evaporation of it, while it lasted. It would take a lot of oil to cover the entire water surface of that moat, but any oil on the water surface, could be ignited. It would burn off quickly, but it would still be "exciting", for the attacker to experience. Heck, it would be more effective if the defenders poured the oil over the top, when needed, onto the attackers, then ignite it, for maximum effect. But still, covering the water with oil could alleviate the need to replenish the water in the moat as often… >;-) Cheers! The problem was I never had enough figures to attack it properly. That's where the cannons come in handy. The downside is that you need a destroyed/partially destroyed version of the Keep for game play. But that is better for the table top than the old fashioned way of starving out the defenders.